If N = M×s then M = gcd(N, M). N = M×s + R implies gcd(N, M) = gcd(M, R). Euclid's algorithm is based on the observation that taking R to be the remainder of the division of N by M makes R < M. Which means that the task of finding the gcd of N and M, with M < N, can be reduced to the same problem but with smaller numbers, M and R. Doing that we'll get another remainder even smaller than R and so on until the remainder becomes 0. This is assured since on every step we are dealing with smaller numbers, but a decreasing sequence of integers is necessarily finite. In the case of the remainders in Euclid's algorithm the last term must be 0 for, otherwise, one would be able to perform at least one more step of the algorithm. The applet below illustrates Euclid's algorithm. The two numbers on top are modifiable digit-by-digit. Click a little off the vertical midline of the digit you wish to modify. (For a faster action just drag the mouse up and down.) 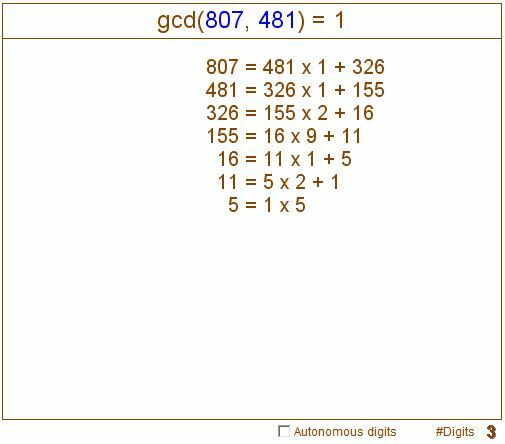 When the box "Autonomous digits" is checked, trying to increase, say, 9 in 19 will result in 10, otherwise it will be 20. The number of digits is also controlled at the bottom of the applet.